Neoβ0ToxinA® has shown excellent performance on the treatment of wrinkles. 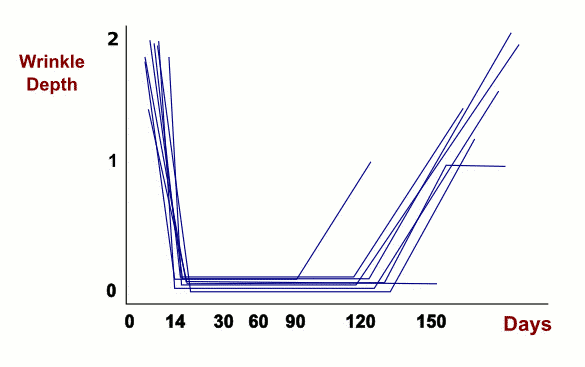 The following electromyographic data, kindly provided by International Cosmetic Research Application Unit, shows results of a trial conducted on 600 women in Iran, with graphs iustrating the situation before injective treatment in glabellar lines and at follow-up visits, at 14, 30, 60, 120 days. 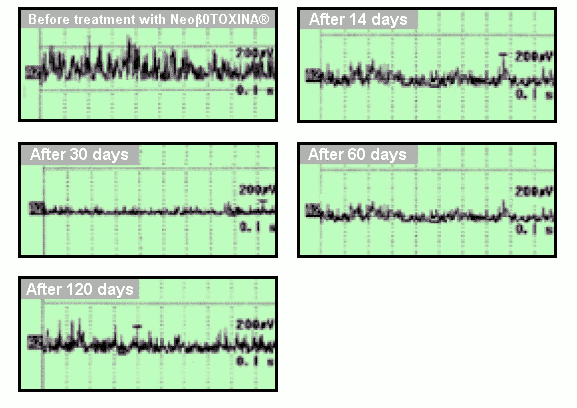 Glabellar lines treated with Neoβ0ToxinA® have had a marked improvement for an average of 4 months. The results show that freeze-dried β0ToxinA® will keep its efficacy at room temperature for one week, present a small drop in efficacy for 10 days, and a 15-20% drop in 3-12 months.